1) DIPLOMA VALIDATION PAGE: To ensure the Degree information is still valid, we highly recommend you visit Brandeis University's CeDiploma validation website, to perform additional validation. Enter the 12 digit CeDiD found in the upper corner of the CeDiploma, along with the first two letters of the name as it appears on the CeDiploma. 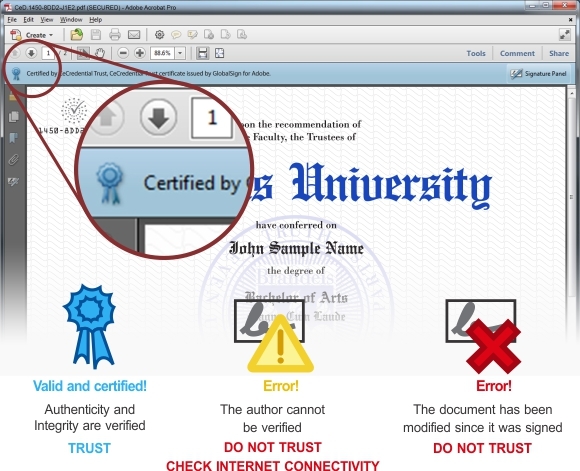 2) DIGITAL SIGNATURE: All CeDiplomas from Brandeis University are digitally signed by CeCredential Trust. When the document is viewed through Adobe Reader or Acrobat versions 9.0 or higher, it will reveal that a Digital Signature has been applied to the document. Adobe Reader and Acrobat use a blue ribbon across the top of the document to indicate that the document has not been tampered with and is therefore authentic. Attn Mac users: When viewing an official electronic credential from Brandeis University, the software utilizes Adobe's secure certified PDF technology and therefore can be viewed using only the free Adobe Reader or Adobe Acrobat 9.0 or higher. The default Mac preview application will not display the document correctly. If you have any further questions, or need additional help, please email registrar@brandeis.edu. For all inquiries, we ask that you kindly include the CeDiD and the name of the Alumni as it appears on the CeDiploma.